A trash-filled ocean is fast becoming a reality, as humans use it as a dumping ground for more and more waste. 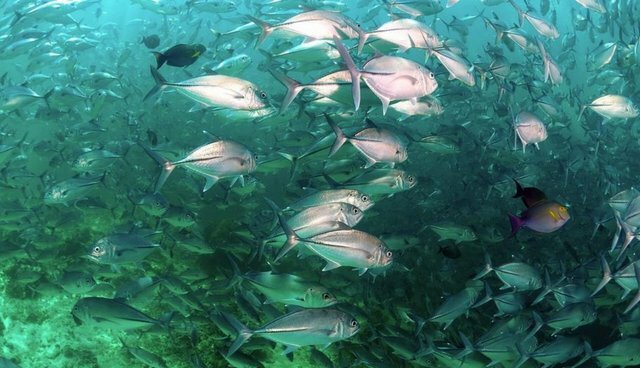 Right now, there are about 800 million tons of fish in the world's oceans, according to the Food and Agriculture Organization. There are 100 million to 150 million tons of plastic. Andreas Merkl, CEO of the Ocean Conservancy, told the Guardian that a lack of adequate recycling paired with growing world economies may soon result in "an ocean that has an amount of plastic that's in the same order of magnitude as the amount of fish, in terms of tons." Some areas of the ocean are more trash-filled than others. Most notoriously, the "great Pacific garbage patch" is an area of ocean in the North Pacific Gyre that contains one of the world's largest concentrations of plastic trash. See this page for more information on how to help clean up marine trash and pollution - before our oceans are home to more plastic than fish.